What is your best e Marketing advice for a brand new boutique/Eco hotel that is just beginning to position itself in the market with a very limited budget? There are many great marketing solutions for any boutique hotel or accommodation business. In the following, I will list a few strategies and methods that we are using in our hotel and that I explore on my website http://www.hotelbusinessmastery.com. A. Make a video of your accommodation and introduce yourself and staff. Make it vivid and exciting. Try to implement jokes. Be yourself and don’t pretend to be someone you are not. Authenticity is very valuable while you record this video. You can start the video in front of your entrance, show your potential new guests where they can park their car, where they enter the accommodation, how the reception looks like, what kind of services they can expect in your lobby, how a room looks, what kind of amenities you have, where they can chill for a while, where they can find the breakfast room, I guess you get the idea. By and large, show off. Show your audience what you are all about. Your potential new guests will appreciate your efforts and see what you are all about, and more importantly, they will get to know you. You will not be any stranger anymore as soon as they enter your hotel and stand in front of you. Perhaps one day a new guest will stand in front of you and say, “Hey I watched your video - thanks for the nice introduction” - right there a magical moment appears that you can grasp and transform to a guest relationship. If you start to take these baby steps, then you will realize that they make sense and that it is easy to connect the dots. Day after day you can establish relationships with new guests that will start to do word of mouth marketing for you. Like that, you will automatically position yourself in the market and gain excellent guest reviews too. B. I would like you to check out the following YouTube video Increase direct bookings for your accommodation to see what I mean with being personal and providing your potential new guests’ value they love to hear. In the video, I am providing our potential guests information on how they can reach our hotel from the airport or the central station. I am taking my guests by the hand and show them step by step where they must go and make transfers to reach our accommodation. This video increases our image, and we differentiate ourselves from other hotels enormously. There are four main benefits that this video provides to the new guests. They see how devoted you are to be providing exceptional services to your guests by giving direction to your accommodation. For some foreigners, it is sometimes difficult to figure out how to reach your accommodation with public transportation. By providing them this video, you take their worries away. It is like you are talking to them on the phone and telling them step by step how to reach your hotel. C. Another proven way to build trust is feedback videos/testimonials from your guests/interviews. If you got to know a guest that seems to be willing to give you an interview and talk about your accommodation in a very positive way, then you do not hesitate to ask this person for an appointment and set everything up. Interviewing and recording a guest who is amazed by your services and overall management style is the best marketing you can have for your business. Have a look how simple an interview can be. In that way you will convince people who are interested in making a reservation for your accommodation entirely. This method can be seen as a final touch. By the way, interviewing a guest is a lot of fun, and you will strengthen your guest relationship. The following strategy is necessary for your business. It serves any business. Read carefully because this is a huge game changer. A. Write a list of your Unique Selling Propositions. To have a better idea of some USPs I list some of ours. As soon as you are ready with your list, do the following. Post this list before your signature in every email that you send to someone. If you do, the receiver of the mail will get to know your USPs and know exactly what you have to offer. Right out of the gate, you let your audience know what makes you unique. By posting your USPs before your signature in every email, you are answering the most FAQs. The USPs listed above are the answers to the FAQs of my guests. This measurement saves us a lot of time explaining the questions repeatedly. Like that we are one step ahead of our guests. Thus, they do not have to write us another email asking us where they can park, how long it takes to the airport, etc. By inserting your USPs, you add incredible value to every mail that you send out. Using your USPs in your emails is not the only place where you can use them. There are two more I would like you to know of. B. The second place where you should use them is on your digital business card. Your digital business card is your website. Therefore, make sure that you find the right place on your site where you implement your USPs. It should be a place where they can be seen in no time. Preferentially, at your landing page so that your visitors do not have to click on any button to see them. Put them right on your first page to create the most significant impact. C. Have a look at the following video to learn more about the third spot where you should use your USPs. By watching this video, you will learn too how to increase your direct bookings. 3. In this post, I share another idea with you that will undoubtedly increase your direct bookings and make potential new guest remember you well. If you are interested in learning more and digging deeper into more valuable hotel marketing strategies, then I recommend watching my free tutorials on the following page - click here. As you know, your digital business card lures potential guests to make a reservation in your accommodation. Thus, by inserting the following item, you will increase your direct bookings. If you have a “Digital Hotel Info Map,” then make it available on your website. Tell your visitors that they can download your accommodation presentation and that they will find a surprise inside. The surprise your visitors will see inside the digital hotel map is a unique coupon code valid for any reservation made through your booking engine. With this strategy, you will first make your visitors download your presentation and second through the discount code they will be excited to make a reservation on your website. On my website, you can download your own digital hotel info map. Challenge Life. Explore. Enjoy and Give. Free Report - The 10 Simple Steps To Receive Great Online Ratings! 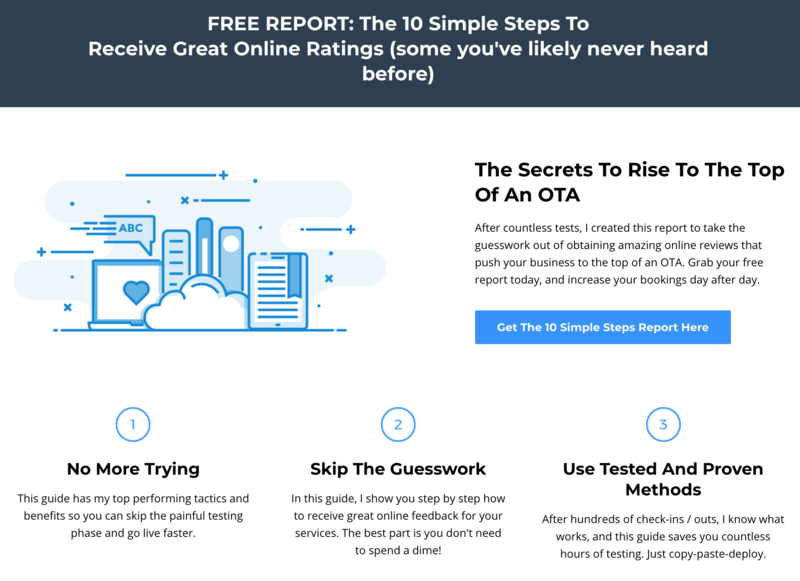 "Free Report" The 10 Simple Steps To Receive Great Online Ratings! Instant Access & Instant Implementation Process. Step By Step Guide Included! Free Report - Download Now!